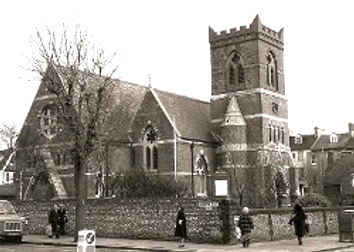 Development of the Cliftonville estate, on the then western edge of Hove, started in the 1850s, placing more pressure on the already crowded parish church of St Andrew. 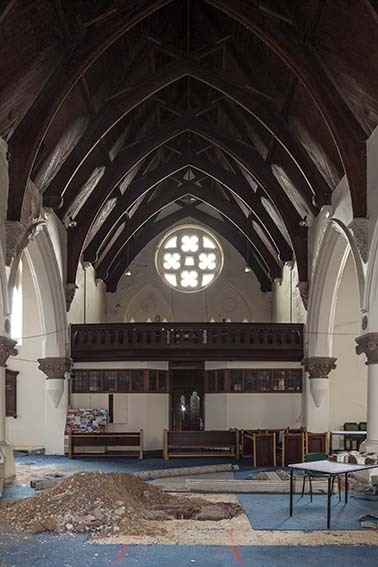 Therefore, in 1863 Holy Trinity was begun, starting with the nave, chancel and south aisle. The architect was J Woodman (B 21 p282), a local man. The tower in the centre of the south aisle followed in 1866 and the north aisle two years later (B 25 (15 June 1870) p ii). There was what was described as a restoration in 1882-84 at a cost of £618 (KD 1899) but this has left no obvious trace. 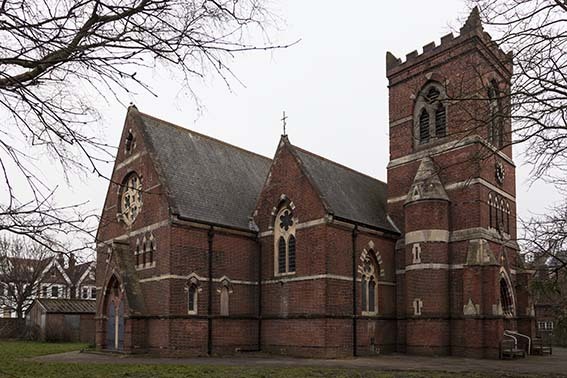 Woodman’s red brick church is of its period, though it shows an imperfect understanding of the mannerisms associated with greater architects of the period, such as the polychrome decoration round the windows. The tower served also as the entrance; it has a heavy round stair-turret and battlements but lacks the intended spire (1 p4). The heads of the narrow side-windows of the apsidal chancel are in steeply pointed gablets breaking the roofline. Inside, the arcades have over-sized carved capitals and the plaster chancel roof imitates vaulting; the roofs of the aisles defy description. 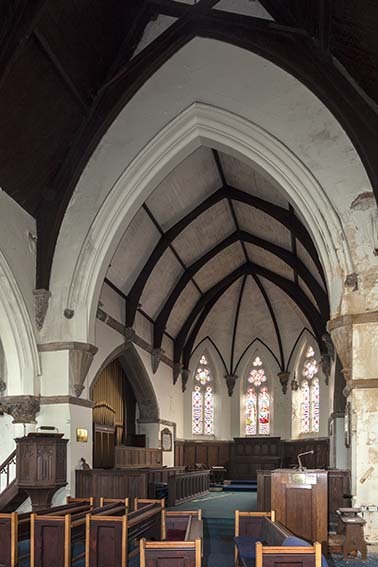 A west gallery, unexpected in a church so obviously a creation of the 1860s, demonstrates its evangelical tradition. 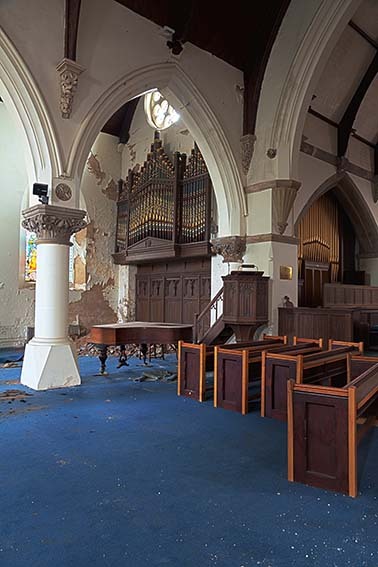 In 2007 the church was made redundant (The Victorian, July 2007 p16) and its future remained unresolved while the fabric deteriorated visibly, though it was a listed building and the case aroused considerable concern amongst conservationists. 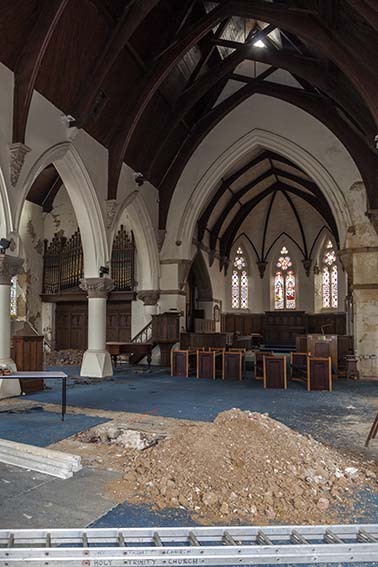 The first intention of the diocese was to sell the site for demolition and the building of housing, but after further protests, work commenced in 2016 on converting the church into a medical centre which was opened in September 2017. Though less than ideal, since the interior has been subdivided both vertically and horizontally, the church still stands, unchanged externally except for an extension west of the north aisle to house a pharmacy. In addition, the main entrance is now at the western end with a glazed porch of rather ecclesiastical appearance. Font: 1878, with an octagonal bowl bearing carved emblems, resting on four short marble columns. Font cover: Open ogee-shaped of wood. Dated 1920. 1. (Three in apse, north aisle, second and third windows) designed by Henry Hughes of Ward and Hughes (1 p7); these are mostly signed. The dates range from 1864 to 1877. (South aisle first and second and north aisle fourth windows) By Ward and Hughes without any designer being named. 2. (North aisle) One window by J Hardman and Co, 1867 (Easter garden) (ibid). 3. 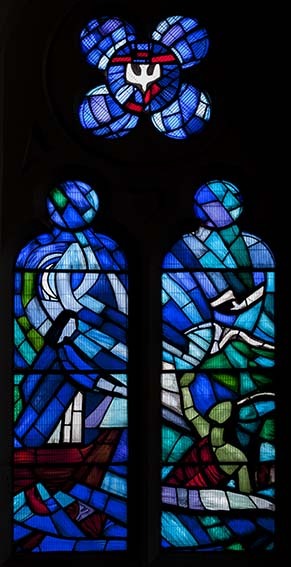 (South aisle) Christ and St John, walking on the water; stylised figures, mostly in various shades of blue, by M Douglas Thompson, 1971 (Antram and Morrice p200). 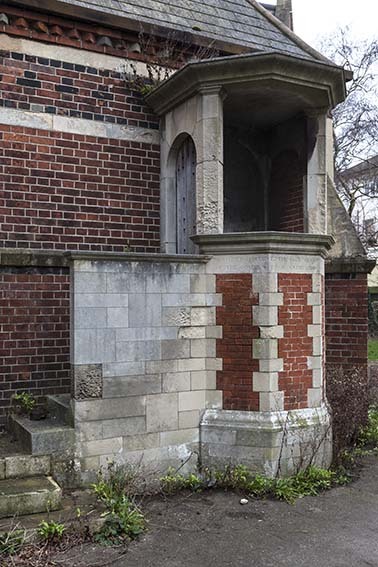 Pulpit: External pulpit on the south side of the chancel, 1912. This had ceased to be used even before closure.